This page is about Royal Palaces, Houses, Castles and Forts that were used or visited by monarchs in Tudor times. Click on the names to find out more about the buildings. The Tower of London – Famous for being a palace, the place where Kings and Queens spent the night before their coronations, a place of refuge in times of danger, a seat of government, a prison and a place of torture and execution. Click here for a map. Hampton Court Palace – Originally built as a lavish palace by the ambitious Cardinal Wolsey, this house was acquired by Henry VIII when Wolsey fell from grace and renovated to become a palace fit for a King. Click here for a map. 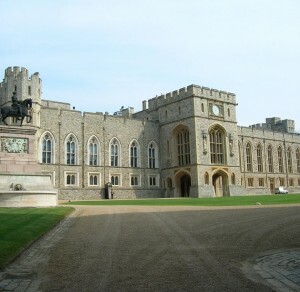 Windsor Castle – This castle, which dates back to medieval times, is known for being a royal residence and the resting place of monarchs like Henry VIII. Click here for a map. Greenwich Palace and Park – Greenwich was used as a royal residence from the 14th century and was the location of many important events – the birth of Henry VIII, the births of Mary I and Elizabeth I, and the death of young Edward VI. Like Edward IV and Henry VII, Henry VIII worked on the palace enlarging it and remodelling it to suit his tastes and needs. Unfortunately, it was demolished in the 17th century but is now the location of the Old Royal Naval College and the National Maritime Museum & Royal Observatory. Click here for a map. Hatfield Old Palace – Once the nursery of Henry VIII’s children and the “sanctuary” of Elizabeth I, during Mary I’s reign, this Tudor palace can still be visited today. The gardens are beautiful and there is a Jacobean mansion, Hatfield House, which was built by Robert Cecil, first Earl of Salisbury. Although much of it was destroyed in the 17th century, you can still see the hall where Elizabeth I had her very first Council of State. Click here for a map. Kenilworth Castle, Warwickshire– This is a medieval castle but was an important building during Tudor times, being the home of Elizabeth I’s favourite, Robert Dudley, Earl of Leicester. 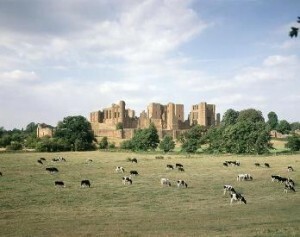 I was lucky enough to be based near Kenilworth Castle when I was a university student and loved visiting it, particularly when they held special events there. English Heritage have done much to improve the castle and you can now see exhibitions, an audio tour and a spectacular recreation of Elizabethan gardens. Click here for a map. Leeds Castle, Kent (not in Leeds, Yorkshire!) – This castle was a royal residence from the Middle Ages and is famous for being renovated by Henry VIII for his first love, Catherine of Aragon. Click here for a map. Sudeley Castle, Cotswolds – Sudeley was a royal residence from Medieval times until Tudor times when Edward VI gave it to his uncle, Thomas Seymour. Thomas Seymour lived there with his wife, Catherine Parr, Henry VIII’s widow, and with the famous 9 day queen, Lady Jane Grey. Elizabeth I also visited the castle. Click here for a map. Tilbury Fort – Tilbury Fort was originally built in 1539 by Henry VIII but most of the present day fort dates back to the 17th century. It was near this fort that Elizabeth I rallied her troops in 1588 before they went to face the Spanish Armada. Click here for a map. St James’s Palace – Another Tudor royal favourite which dates back to the 1530s. It is still a royal residence and so is not open to the public, but you can visit its lovely park. Click here for a map. Carisbrooke Castle, Isle of Wight – This castle was modified during the Tudor period so that it could house the huge guns needed to defend England from Spanish and French invasions. Click here for a map. Framlingham Castle, Suffolk – This was Mary I’s former home and she was at this castle when she found out that she had become Queen of England. Click here for a map. Ludlow Castle, Shropshire – Famous for being the place where Prince Arthur, Henry VII’s eldest son, died. “Arthur’s Tower” is named after this English prince. Ludlow Castle Lodge in the centre of Ludlow is also a Tudor property. Click here for a map of where the castle is. Pendennis Castle, Cornwall – Another of Henry VIII’s fortifications to protect England from Spanish or French invasions. Click here for a map. 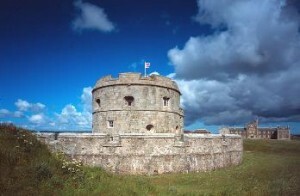 Portland Castle, Weymouth – An extremely well preserved fortification built by Henry VIII. Click here to see a map. Scarborough Castle, Yorkshire – This northern castle is famous for being held by Thomas Stafford who did not agree to Mary I’s marriage to Philip of Spain, but has been the location of many troubles and sieges. Click here to see a map. Southsea Castle, Portsmouth – Henry VIII designed and built Southsea Castle, and it is rumoured that it is from a viewpoint here that he saw his ship, The Mary Rose, sink. Click here to see a map. Warwick Castle – A medieval castle which was once home to Richard Neville, “The Kingmaker”, who played a major role in the War of the Roses. Warwick was also home to Neville’s son, The Duke of Gloucester, who later became Richard III. Another one I was lucky enough to live near to so that I could enjoy their jousting shows – fabulous! Click here to see a map. Im interested in visiting Hatfield House after the tour next year. I have limited time though. Do you think its worth a visit ?